Dr. Kevin Vigil (Dr. V) holds degrees from Shenandoah University (DMA), Yale University, (MM) and the University of Memphis (BM). He joined the faculty of Heritage High School in the 2005 – 06 school year. He was named the 2014 Shenandoah University Teacher of the Year for LCPS and presented with a Sir Winston Churchill Commemorative Crown by Churchill Fellow Helen Sanderson for his work in guitar education (2017). Dr. V’s students have had workshops and masterclasses with Dr. Glenn Caluda, Risa Carlson, David Leisner, Martha Masters, Michael Nicolella, Benjamin Verdery, Jason Vieaux, Andrew York, Matthew Denman, Dr. Kenneth Meyer, Marco Sartor, Helen Sanderson, the Tantalus Quartet, the Canadian Guitar Quartet, the Texas Guitar Quartet and the Los Angeles Guitar Quartet. 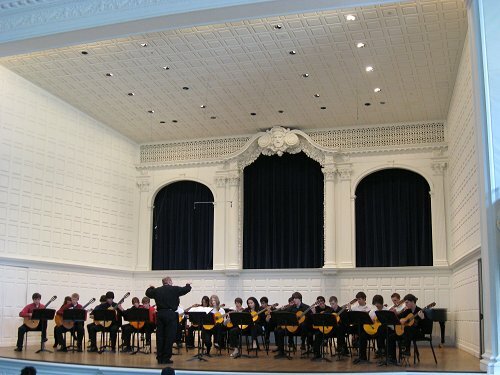 They have performed at the Radford University International Guitar Festival, and the 2006, 2009, 2012, 2014 and 2016 Yale Guitar Extravaganza at the invitation of Benjamin Verdery. Dr. V has been published in several guitar magazines and journals and has presented lectures for the Guitar Foundation of America (GFA), Yale University, Philadelphia Guitar Society and James Madison University among others. Dr. V currently serves as chair for the VMEA Guitar Council and as Member-At-Large for the NAfME Council for Guitar Education.